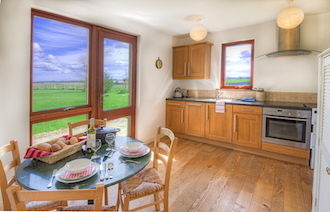 Garden Cottage is a stylish Scottish holiday cottage for two located at the West Gate of Wedderburn Castle in the Scottish Borders. The historic cottage has recently been renovated in a contemporary style and offers the privacy and quiet of the countryside, along with the convenience of being close to the pretty market town of Duns. 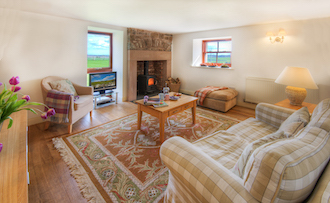 The comfortable sitting room has a huge stone fireplace with wood-burning stove as its focal point. 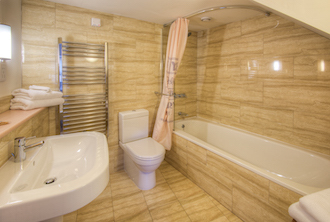 Entertainment is provided through a large flat-screen television with Sky channels and there is also free Wi-fi. The dining-kitchen is a bright room with French doors offering views across a spacious private lawn and fully-equipped with a wide variety of culinary essentials. The wooden flooring throughout the ground floor of the cottage provides a warm, atmospheric feel, and all floorboards were cut from a single ancient ash tree that grew beside the castle and fell during a storm. 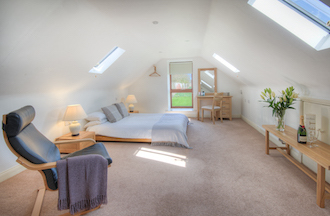 The bedroom has a king-size bed and a full height window framing views of Wedderburn Castle and across the countryside. The chic limestone bathroom has a 1.9m bath with shower. Garden Cottage has a spacious private walled garden that allows guests the option of sunbathing, alfresco dining, BBQs and relaxing in the fresh air. The cottage has parking at the door. "Everything was superb... an ideal venue for couples. We will definitely return."